In virtually every gangster films there are some very predictable tropes. It doesn’t matter which film it is. Films like The Godfather trilogies, Donnie Brasco, Goodfellas have some similarities. There are loud Italian men with shirts unbuttoned and lots of chest hair showing. There is always a “rat” in the mob somewhere. There is always a murder in a restaurant. But there is another trope that is inevitable. When someone is being targeted by the mob, often someone will ask them about their family. And that’s how you know that family’s life expectancy just got a lot shorter. David doesn’t have to be in a mafia film for that to be a frightening question. Because in those days, in order to secure the future of the throne, a reigning king would kill off all of the possible threats to his throne in rival families. Especially families who once occupied the throne upon which he sits. But in this story, David isn’t plotting violence, he is plotting kindness. The Bible does not often give us definitions of abstract ideas; it tells us stories. Stories that invite us to enter and then live. This story shows us the multi-layered dimensions of what kindness looks like in the life of King David. So, what we know about this boy is that he is disabled and has gone into hiding. And as we watch this crippled character come into view we are looking at a hurting, dishonored, and forgotten person. David sends someone to find the boy. Can you imagine how he felt when the knock came to the door and the person on the front stoop was in uniform and has this stern message for you, “Come with me, the king wants to see you”? What might be going through his head? Am I going to be killed? Exiled even further from my homeland? What is my fate? He knows what happens to grandsons of deposed kings in the ancient world. He must have thought that his pointless life is about to come to a violent end. As this boy is laying, face-down on the floor before the king, David calls his name. In fact, David is the first person to actually speak his name thus far in the story. His name appears to mean “from the mouth of shame,” or possibly “One who scatters shame.” Probably not his given name, but one acquired due to the circumstances of his times. Even the town where he is living, Lo-debar, meant, place of no pasture, no hope, total desolation. David looks at a forgotten, disabled vagabond, full of shame, from hopeless town, and does not see a political problem to be solved, or a victim, or a cripple—he sees a human being. Mephibosheth is used to being treated like a shameful disgrace, like a dead dog, and yet David gives him the dignity of looking at him eye-to-eye and man-to-man. But he gives him more than that. David’s loyal love to best friend, Jonathan, has been passed on to his forgotten son, Mephibosheth. And he restores the sizable family landholdings back to him. He brings him out of hiding and gives him a home again. Beyond that, David practically adopts him into his royal family. Picture what life would be like in the years to come at the supper table with David. The meal is fixed and the dinner bell rings and along come the members of the family and their guests. Amnon, clever and witty, comes to the table first. Then there’s Joab, one of the guests—muscular, masculine, attractive, his skin bronzed from the sun, walking tall and erect like an experienced soldier. Next comes Absalom. Talk about handsome! From the crown of his head to the soles of his feet there is not a blemish on him. Then there is Tamar—beautiful, tender daughter of David. And, later on, one could add Solomon as well. He’s been in the study all day, but he finally slips away from his work and makes his way to the table. But then they hear this clump, clump, clump, clump, and here comes Mephibosheth, hobbling along. He smiles and humbly joins the others as he takes his place at the table as one of the king’s sons. And the tablecloth of grace covers his feet. What a beautiful story of lovingkindness. But what I find fascinating is the end of this story where Mephibosheth and Ziba turn up again in David’s life. Years later, David is in desperate and terrible times. His oldest son, Absalom, has driven him from his palace and is trying to kill him. David flees the city with loyal family members and servants with barely a suitcase in his hands. Just as David crests a hill, who does he see approaching him but Ziba. This is the man who had made all the arrangements to bring Mephibosheth to the king’s palace, but Mephibosheth stays behind. And Ziba tells David that he has betrayed him. Not only is his son attempting a coup, his adopted son, Mephibosheth, is betraying him. David flees further into the woods, with his head bowed and his heart broken. Eventually, after David had defeated Absalom and his army and returned to the city, he sought out Mephibosheth. 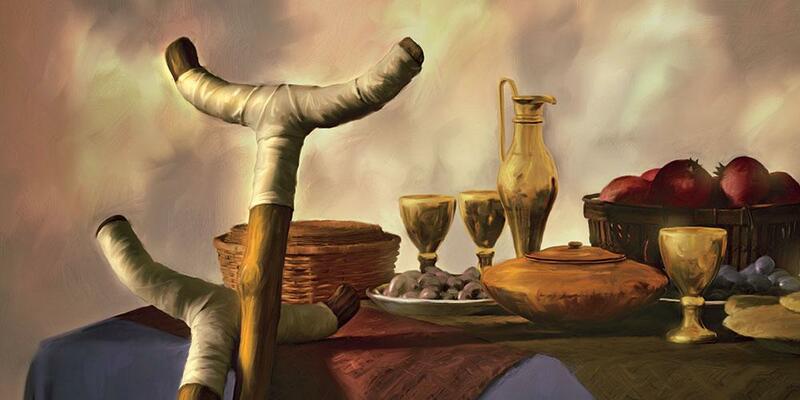 Mephibosheth tells a different story about why he didn’t flee with David. He says that Ziba is not telling the truth and had left him alone in the city and because he was lame, so that he couldn’t follow David. David knows that these two men can’t both be telling the truth. Somebody is lying and abandoned him in his most desperate hour at best or had intended to betray him at worst. He has every right to punish these two for what they have done. But what does David do? Nothing. There is no cross-examination. There is no investigation. David, knowing that one of these two are lying to him, simply accepts both of them back into his house. What this shows us is that there are times when you will open your life to someone and their gratitude is expressed in an abandonment or betrayal. There are times when we will reach out our hands to extend kindness and it will be slapped away. How could David simply welcome both of these back into his good graces and home, knowing that one of them or both of them have stabbed him in the back? How is David’s soul large enough to handle dishonesty and rejection from the people he had helped so much? David could only give away what he received. He had been the recipient of the kindness of God, and that positioned him to be a conduit of that same kindness back to those who had betrayed him. Perhaps David’s mind flashed back to when he was but a boy, tending sheep outside of Bethlehem. He is the last of eight sons. There was a worshipful celebration happening with cranky old Samuel and he hasn’t been invited to attend. But then word comes to him that Samuel wants to see him, and standing face-to-face with the old prophet, he hears, “You will be the next king.” Then the warm oil from the horn of the prophet flows down his hair and gleams his smooth and ruddy face. God came for him, through Samuel, and showed him—kindness. David can keep faith with those who didn’t keep faith with him because God kept faith with David. David can express loyal love, even when it is not reciprocated, because David had experienced that loyal love from the God of the universe. Isn’t this a wonderful picture of what God did and does for us in the covenant love put on full display in his son Jesus? Because in all the ways that matter most you and I are not that much different than Mephibosheth. We are all morally and spiritually disfigured. Spiritually speaking we are all dead dogs. We live in a land of no pasture. And even when the kind hand of God is extended towards us, we return God’s faithful love with almost daily infidelity, abandonment, and betrayal. On our own, we are estranged from the King of the universe, but because of what God did through the life, death, and resurrection of Jesus, we have been invited to the King’s table. All of this shows us a principle: You cannot give what you have not received. Only those who have been forgiven, can actually forgive. Only those who have tasted of the kindness of God, can extend the kindness of God. We have had the love of God shed abroad in our hearts so that we can embrace covenant love that compels us to be loyal to the Lord, and faithful to our friends. Pushing down hard with his fists on the table-top he heaved himself up to where he was standing. For the first time we saw he wanted one leg. It was gone from the knee joint down. He was hopping sideways to reach for his stick in the corner when he lost his balance. He would have fallen in a heap if Brendan hadn’t leapt forward and caught him. “I’m crippled as the dark world,” Gildas said. “If it comes to that, which one of us isn’t, my dear?” Brendan said. Gildas with but one leg. Brendan sure he’d misspent his whole life entirely. Me, Finn, that had left my wife to follow him and buried our only boy. The truth of what Brendan said stopped all our mouths. We was cripples all of us. For a moment or two there was no sound but the bees. We are all cripples, all of us, but the good news is that, the son of David—King Jesus—has extended his nail-pierced hand towards us and invited us to sit at His table for all eternity. And the tablecloth of grace covers our sins. This entry was posted in Uncategorized and tagged Forgiveness, grace, Kindness, King David, Love, Restoration. Bookmark the permalink. Excellent. NIce start to the day. Thanks Joe for the article. It was so well written and meaningful. I will be passing it on. Beautifully written and what a message. I shared it on facebook, I hope you don’t mind. Thanks, mom. I don’t mind at all.